A nice circular cast of a lovely trilobite. Its a bit trilobite, one of the biggest, and if you look close enough you might be able to make out its body. Just. 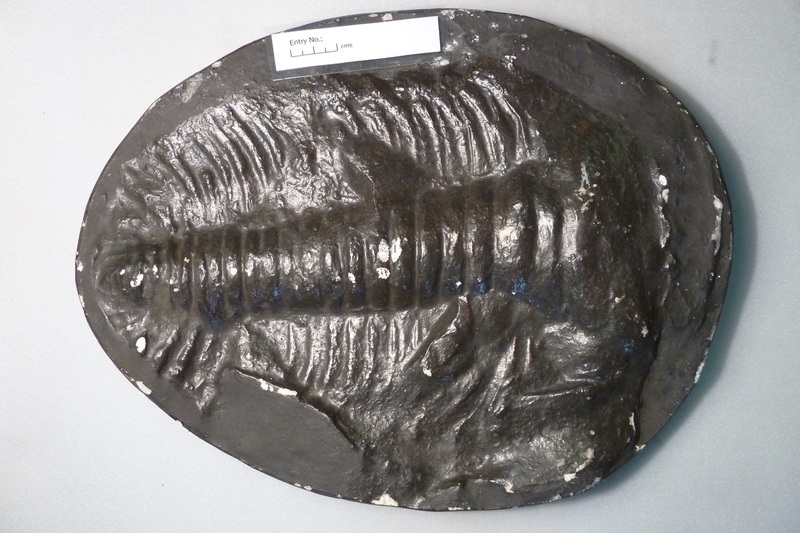 For one of the biggest species of trilobites ever to have lived, you would expect a spectacular cast. I don’t want to disappoint; it wouldn’t be a bad cast if it was spectacular, would it? This is a big specimen. Almost half a metre in length, as long as my fore-arm. It is badly painted (as we would expect by now) and very chipped. Being so chipped may indicate lots of use for displays and talks about this fossil; it is more likely that people didn’t really think it was important, so didn’t handle it well. You can just about make out the axial ring (what looks like the spine running down the middle of the trilobite) and possibly a few ‘rib’ like things coming off the axial ring. Nothing else is very clear. You can see it is a trilobite, but I doubt you would use this specimen to examine the anatomy of these extinct creatures. A trimmed Paradoxides davidis. The ‘trilobite’ is shinier than the ‘rock’. It is another stonker of a specimen at almost half a metre long! This second cast of P. davidis looks intriguingly as though it has had its back and sides trimmed. The hairdresser went by the name of Plate Tectonics. 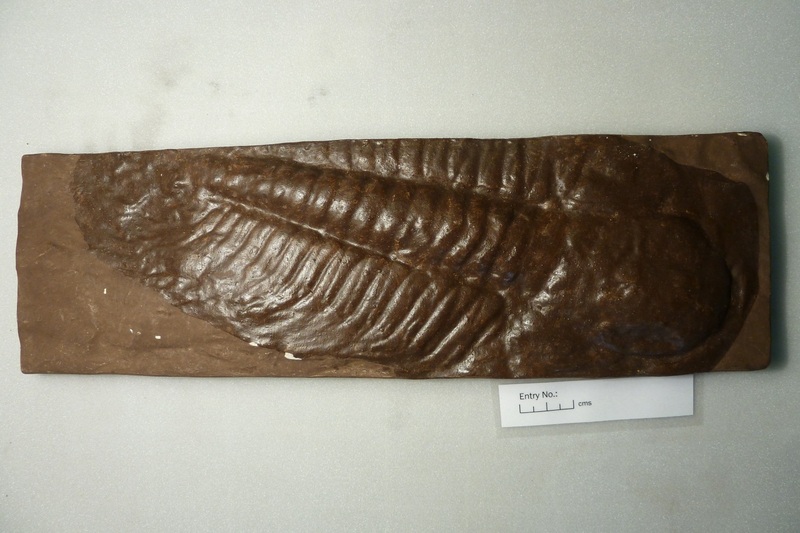 The particular rocks this trilobite was preserved in had been heated and crushed causing fractures cutting through the rock in a thousand different directions when it eventually cooled. 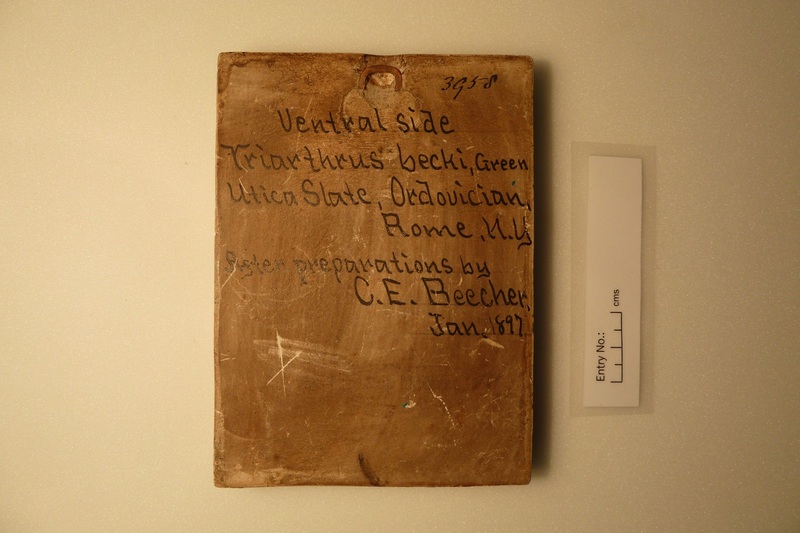 When the original fossil of this cast was excavated, it is likely that there were fractures running through the fossil. I have found similar fossils which have crumbled away in my hand. A fossil can be lost in a hundred fragments; after surviving for millions of years it is lost forever in an instant. Sometimes though, we may be more lucky and some of the fossil does survive the fractures. The world these giants were living in was very different from today. They were swimming in ancient seas around 510 million years ago, during the Cambrian Period. 510 million years! Amazing! These remains have survived scavengers, being crushed by tonnes of rocks on top of them, being heated and deformed, being thrust up onto land, and exposed to the elements! And we can see them! 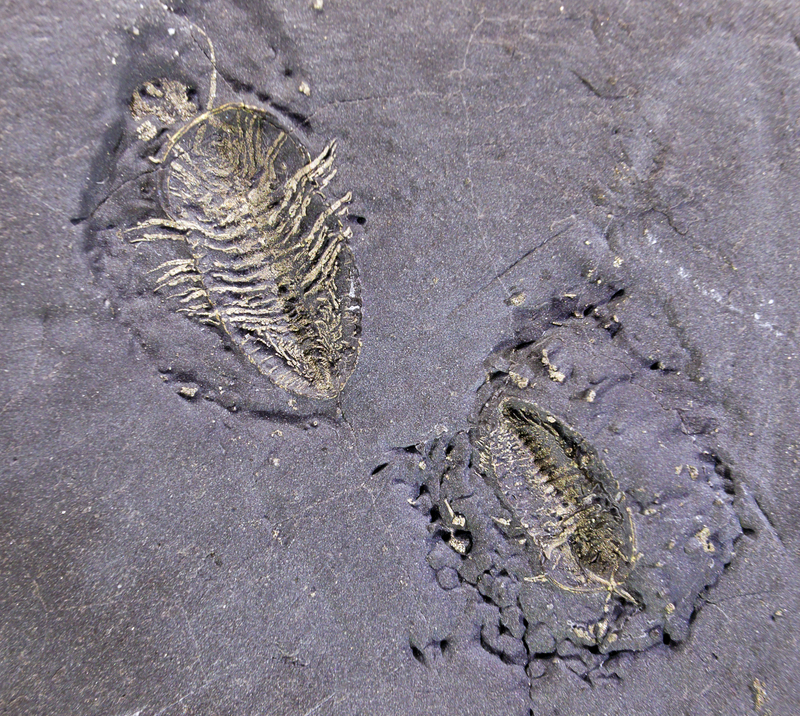 510 million years ago, life had really just begun. Well, complex life had; single celled organisms had been around for at least 3 billion years before. In the Cambrian Period, there was no life on land; it was a barren, desolate place. The seas, however, were teeming with life; trilobites swam below the water’s surface, while others buried themselves in the sediment. Our big friend was very likely to have been a hunter. Although you cant see from these casts, they had big eyes, most likely used for hunting. They would most probably hunted small invertebrates (animals without a backbone) in the seas. 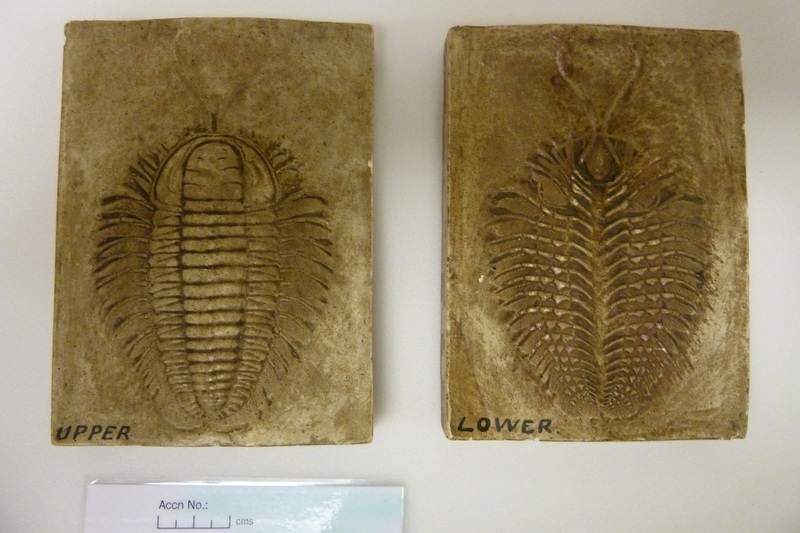 These were some of the largest trilobites to have lived. There were bigger ones, such as the enormous Isotelus rex which was longer than a cat (up to 70cm long). These extinct creatures open up a world long vanished. Long vanished, but not forgotten. This giant is worthy of two casts. They may not be very clear, and were most likely painted by unskilled painters, but they are big. And it seems that the size of these casts compensates for other less satisfying features. 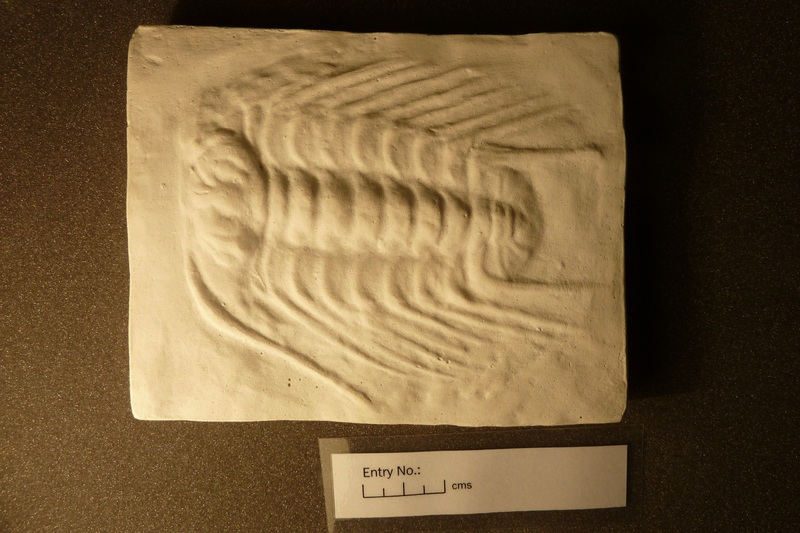 *A bit of background to trilobites can be found on the first bad cast post: The ghost in the rock.